Every Christmas Eve, Italian-American families across the country gather for the "feast of the seven fishes". This elaborate pescatarian meal is my favorite holiday tradition, so when I was invited to attend an upscale interpretation of the feast at Franny's in Brooklyn, I was more than a little intrigued. The event was a part of Franny's "Cellar Series", launched in the fall of 2013 and hosted in the restaurant's intimate private event space. We tucked into the candle-lit, communal table and exchanged introductions with a charismatic crew of actors, musicians and even relatives of the Franny's clan, clinking glasses with a palate-cleansing cocktail of anisette, lemon and vodka. We were welcomed by our host for the evening, General Manager Luca Pasquinelli, who led us not only through the lavish multi-course menu, but also the exceptional—and unusual—selection of wines. 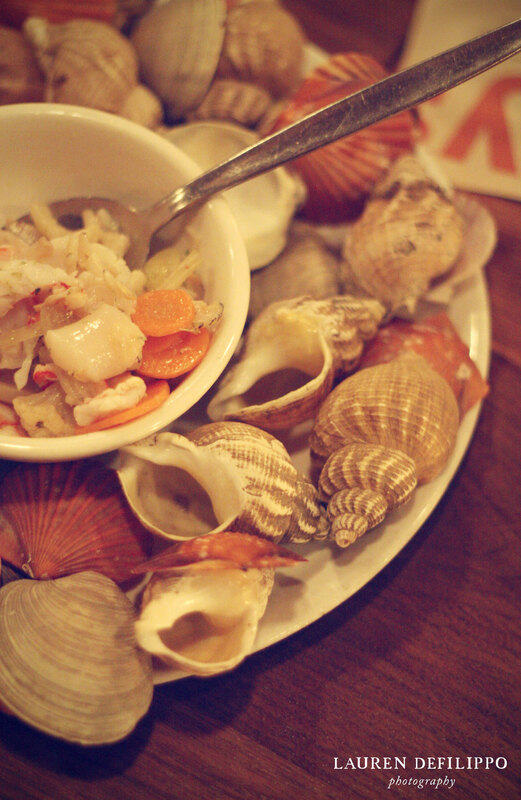 Served family style, the first course of antipasti was a seafood salad of shrimp, whelks and scallops with giardinera (pickled vegetables). Almost like an Italian ceviche, the mix of crunchy pickles and tender fish was a refreshing entry into the meal. Equally impressive was the presentation, a wreath of seashells surrounding each plate—a subtle reminder to be grateful for our lavish meal's origins. From there, the appetizers flowed, raising this often rustic feast to a level of exceptional elegance. Fried eel came not greasy and heavy, but feather-light, flaky and less gamey than one would expect. On the opposite end of the spectrum, the cobia crudo was mild, firm and slightly-sweet—beautifully complemented with a simple dressing of benza extra virgin olive oil and crunchy flakes of salt. Buttery breadcrumbs with parsley and garlic topped meaty razor clams and—richer yet—swordfish meatballs were served in a sauce of their own liquor, lightened with a touch of lemon and white wine. But surpassing all expectations was the polpettone di tonno, creamy molded cakes of tuna that could convert even the most adamant opponents of the famously canned fish. Like a pescatarian foie gras, this jewel of a dish surpassed celebratory; for a fish lover, it bordered on a spiritual experience. The meal continued to ascend from there. Following the tuna was a deeply pigmented squid ink pasta, cut into a chittara shape (imagine a denser, square spaghetti), laced with a sea urchin sauce. 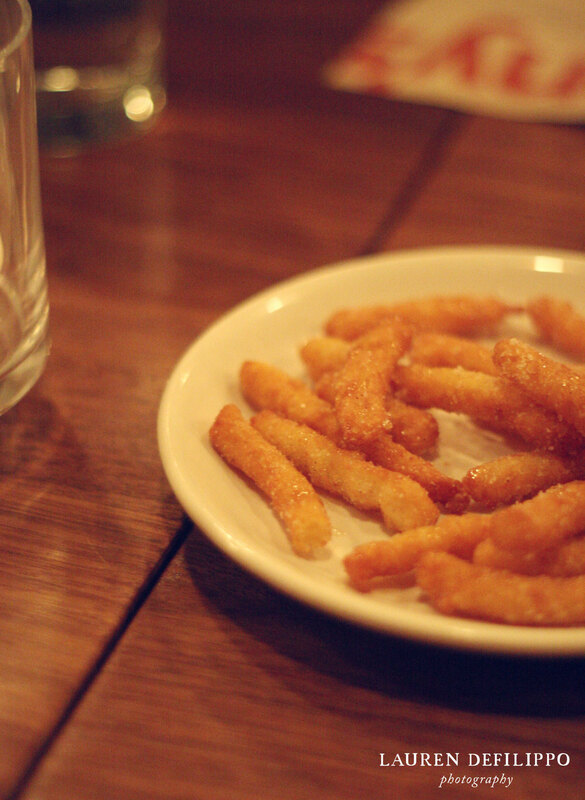 The texture of the pasta was enviable—al dente, but with a chew that clung to your teeth like the crust of good bread. The urchin brought a complex sweetness and element of umami to the dish, marrying beautifully with the earthy, briny ink. It was a combination of flavors that might cripple all but the most talented sommeliers, but Franny's team expertly chose a pine'y, smokey Fiano di Avellino. Its flavor was as concentrated as that of a dessert wine, but without the sweetness, leaving—after several sips—a satisfying sensation akin to a stinky parmesan cheese. A rich, red shrimp and tomato stock came next, dressing mussels, shrimp and calamari in its fragrant soup. This was paired with the most unusual and rare of the wines that evening: a Suscaru 5 from Sicily. Its cloudy color reminded me of cold sake, with the tint of a deeply red rosé. Tart and almost vinegary, it brightened the flavors of the soup (as would a squeeze of lemon). As Pasquinelli explained, Suscaru is made in only the smallest quantities, due to winemaker's rustic methods—an exceptional treat for any diner. For the final savory course, the presentation was more "old country", featuring a polenta and salt fish gratin. More briny than salty, this lighter take on what could easily be overly hearty fare was still rich with flavor. The dish underscored the underlying message of every plate that came before—that quality ingredients are king. Even a simple side of bitter puntarelle (a long, thin chicory with curled fronds), pan-fried with anchovy and oil, was an unexpectedly addictive dish. Last but not least, a pile of temptation: airy zeppole (squiggles of fried dough) with honey, cinnamon and sugar. Paired with a maple syrup-like Marsala from Sicily, it was a perfectly sweet finish to a truly outstanding meal. As we reminisced about our favorite dishes, I was as filled with a sense of gratitude as I was impressed with the quality of our meal. There are few restaurants that can so convincingly pull off a communal table supper, asking diners to share course after course of enticing plates. It was a nod to the celebration's humble origins (in the fishing villages of the Southern Italian coast) and to the seemingly endless bounty of Italian hospitality. And yet, each plate was more than a nostalgic reflection of the past. This feast of the—not seven, but twelve—fishes did more than reinterpret traditional dishes; it elevated the satisfying "simplicity" of Italian cuisine, showcasing exceptional sourcing of ingredients and craft.